The picture above is outdated and will be replaced soon. The speakers and mike shown are wrong, but the desk unit and hub are correct. No radios are shown connected. The desk unit can be obtained in many colors, although only a few are on hand at the moment. For those who need only a simple remote control for a few radios. Not computer based, it is entirely analog and is highly repairable. The parts are relatively common and none are too small for a reasonably skilled technician to service. Being analog, it never needs rebooting and cannot be remotely hacked. The four radios may have up to four channels apiece, for a total maximum of 16. Each radio should have its own antenna, as joining through a combiner usually limits the frequencies that may be used. Since one may be keyed while another is receiving, some way to reduce interference should be implemented, such as positioning the antennas for minimum crosstalk. Since all the radios are controlled from a single hub unit, and the connection between the hub and the radios should be fairly short (a few feet), this system is not intended for controlling radios that are spread between different sites. The hub can have, as an option, switches to set up repeating between the connected radios: Incoming traffic on one (or more) can be retransmitted on another (or several). If the setup is never to be changed, the switches can be internal jumpers. If you do not need this, that entire sub-board can be omitted from the hub. There can be an unlimited number of operator points, but the hub has inputs for just two. This can be increased by adding simple ethernet-style splitters on the line(s) to the desk positions. The system does not use ethernet protocol; 4-pair ethernet cabling was chosen because such wire and jacks are easy to obtain. The desk positions can be much further from the radios, although line loss makes 200 feet an advisable limit. You could try for more and see if it is still reliable. The desk units do not need to be co-located, although one scenario has four dispatchers in side-by-side cubbies. Another puts the desk units in different offices in a building. 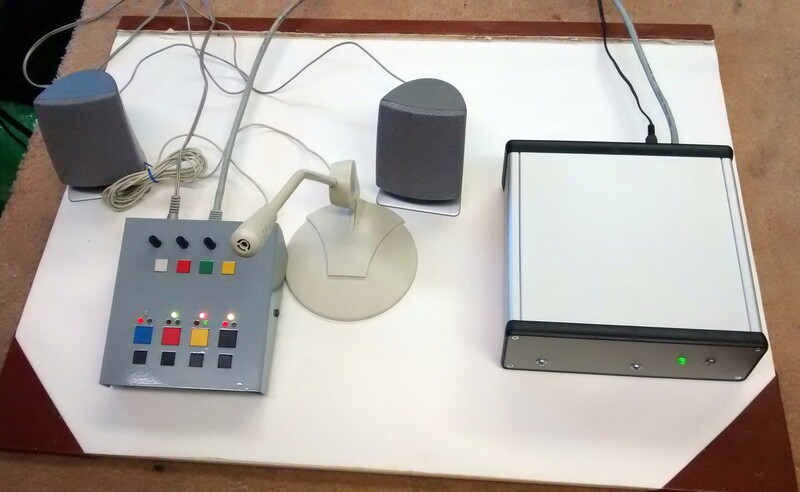 If the desk positions are close to each other, such that the reception in the speakers of one can leak over to the microphone of another, the desk units affected can be modified to crossmute to prevent audio feedback. The desk units are designed to drive headsets, and using them would also prevent feedback. The desk units cannot drive simple unpowered speakers. Use common computer-style powered speakers instead. The hub also has an output for four channels to a logging recorder. This is supplied at +4dBm 600 ohm balanced so the recorder can be located quite a long way away from the hub, even thousands of feet. This is sent over common ethernet style 4-pair cable. The desks units are powered from the hub on the same cable that connects the control signals and audio. If the distance to the hub is great enough to affect the power (not likely), any desk unit can be modified for its own power. This modification can be done by a competent technician. The voltage is 12.6-15v, for compatibility with lead-acid battery backup. Although it could be powered from a very common 12.0v walwart, this is not what it is designed for. For more details download the pdf user manual here. Technicians may be interested in the schematics (Desk and Hub) and the board layouts (not yet available online). For version 1 of this system, see this page. There was a version 2, but it never was put into service; it became the basis for version 3. The photo at the top of this page shows it. The rest below describes version 3 at an earlier stage of development.